X-23(M) and X-25(M) Professional Airless Paint Sprayers are the best choice for professional painting contractors, who are looking for superior performance and control for daily use on residential, property maintenance and commercial applications. These airless sprayers will apply all standard primer and paint coatings quickly, easily and efficiently. 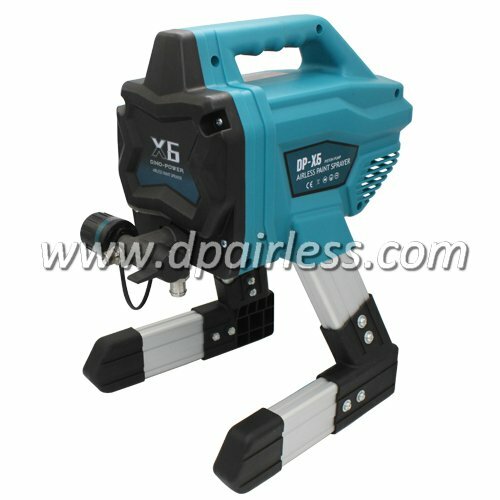 This item is designed for professional painters / contractors / industrial usage. 6. Swivel Inlet Suction Hose – solid aluminum construction and no tools removal of hose. 7. Suitable for spraying many kinds of colorant, varnish, latex,lacquers, latex,stains, enamels, oil-based and latex-based painting etc. 8. Ideal for small to medium size area, like Interior/Exterior Residential, New Construction, Repaint/Remodel, Light Commercial, Property Maintenance, machinery etc. Contents in Package: Airless paint sprayer pump, 1pc airless spray gun with 517 tip, 1pc 1/4″ * 15m high pressure hose, 1pc 45cm extension pole, tool kit, lubrication oil, manual.